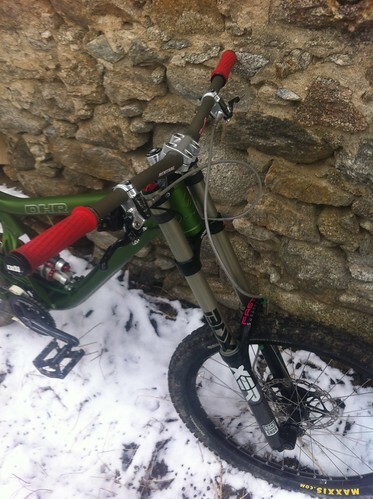 Jo is selling his trusty 5.Spot. This is an amazing trail bike, it will take you anywhere and back with a smile. The frame has been fully rebuilt at the end of the season (new axles and bushings), got a couple of minor scratches and a dent under the bottom bracket (see photo). Suspensions have been serviced. After being bought by Adidas, the leader of flat pedals shoes, has developed and brought out some new products using the experience of the German giant. The first is the Freerider VXi (“five ten innovation”). Those shoes don’t have much in common with the original Freeriders; lighter (-100g), thinner (less friction with the crank), stiffer (better energy transfer) and more breathable, they are much more efficient when pedalling. The big change though is the completely slick part on the sole of the shoe. The goal? 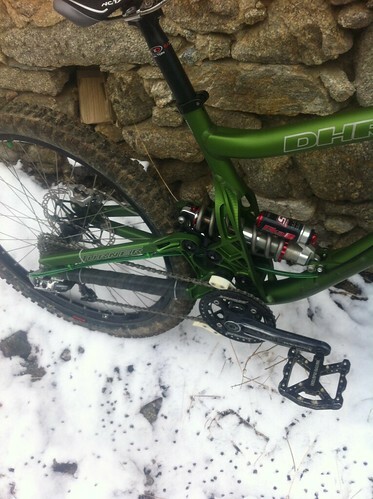 Being able to move your foot more easily on the pedal without compromising the grip and… it works! It doesn’t make any difference when walking on dry ground but beware the shoes are REALLY slippery on wet surfaces! These shoes are perfect for riders who like to pedal and hike a bike only on dry terrain! I do love them though but would keep a pair of traditional Freeriders for wet rides. 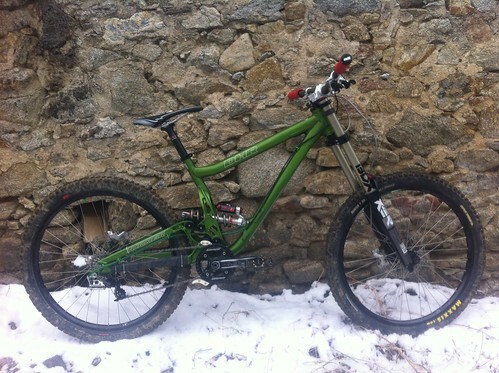 Here is my new DH bike, a Turner DHR 2012. I’m using pretty much the same parts as last year, apart from new bars (Renthal) and lighter/tougher saddle (NC17). Fast Suspensions has also updated the suspensions… can’t wait to open the throttle wide!